Our passion is jewelry of the past. 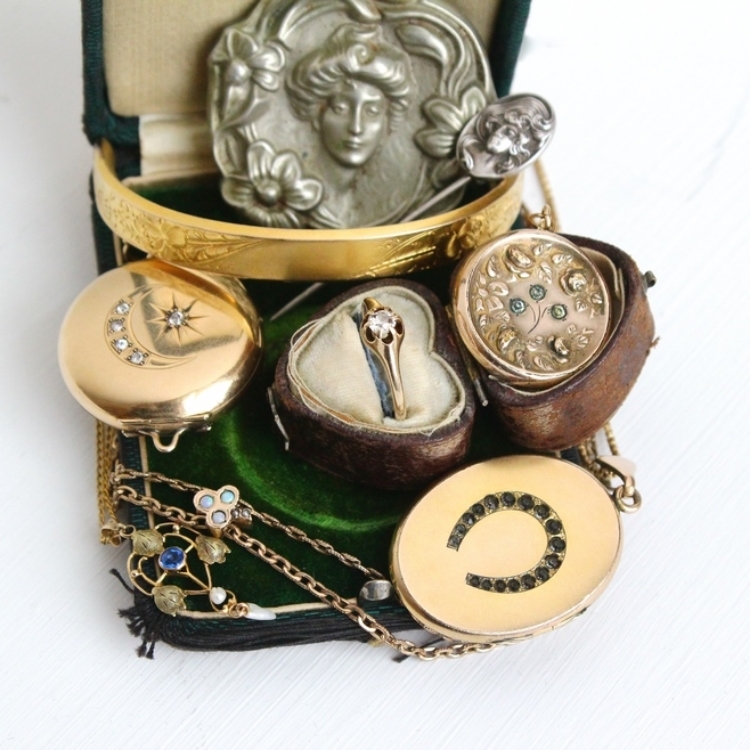 Maejean Vintage is an online vintage and antique jewelry shop specializing in heirlooms of the past. The shop also offers a line of handcrafted vintage-inspired jewelry designs made with recycled gold and responsibly sourced gems. The people of the Georgian Era loved all things rich and royal. Jewelry was typically only worn by the wealthy, which was represented in the sumptuous and rich aspects of the pieces. During this time period hand crafted molds and 18 karat or higher gold was used. The Georgian Era introduced the trend of having daytime jewelry and nighttime jewelry. Pearls and shell were common in the more demure daytime jewelry, while the evening brought out grandiose and luxurious accessories. Symmetry and opulent gold work is prevalent in Georgian jewelry. Jewelry from this time period is becoming increasingly rare and is highly sought after by collectors. The Roaring Twenties was fueled by the fast paced movement of the machine age. The decade began with the ratification of the 18th amendment, which banned alcohol, and the passage of the 19th amendment, granting women the right to vote. The term Art Deco was birthed from the 1925 Word's Fair Exposition in Paris, France “Internationale de Arts Decoratifs et Industriels Moderns.” Art Deco was gleaned from part of the event’s title and is subsequently used to describe a specific decorative style featuring geometric shapes, sleek lines, colorful motifs, with a bold and modern feel. The flowing nature-inspired designs of the previous Edwardian Era were quickly replaced with Art Deco’s streamlined, highly geometric designs which were influenced by technology and industrial advancements. The Victorian Era was where romance and symbolism really came into play in the art of jewelry making. Queen Victoria’s husband, Prince Albert, died at the young age of 42, which caused her to go into years of mourning. This tragic loss caused more macabre aspects of jewelry to be introduced. Hair from a loved one's head was woven into jewelry to keep deceased family members close. The Queen had her children's teeth made into different jewelry pieces, also showing the sentimental side of jewelry. In an era where private things were often not discussed, the Victorians turned to symbolism and secret language through the use of jewelry. For example, a piece of jewelry with colored gemstones set in a pattern to spell out a secret message. This era also brought about the love of earthier colored gemstones and pebbles because of the Queen’s love of all things Scottish. The mid-20th century saw the growth of the middle class, and with this prosperity came large statement pieces, jewelry sets (often referred to as a parure), and showy “cocktail” rings. During the 1950s, diamonds’ popularity increased amongst consumers, particularly due to De Beers “A Diamond is Forever” campaign. Designers looked towards nature and animals for inspiration, and often incorporated these motifs into jewelry design. They embellished their pieces with colorful rhinestones and artistic textures. The Modernist Art movement inspired “wearable art”, such as large and abstract free-form jewelry pieces. The Edwardian Era is considered to have begun in 1901 when Queen Victoria’s son, Edward VII, began his reign as king. The Art Nouveau movement (meaning “New Art”) occurred during this time frame. Art Nouveau jewelry designers often looked toward nature to inspire their mystical creations. Edwardian Era jewelry pieces often contain symbolic motifs, such as stars, moons, animals, and horseshoes (because of King Edward’s love of horse racing). Necklaces from this time period include sautoirs, lavaliers, and festoon necklaces. The Edwardian Era came to an end with the start of the first World War, around 1915. Our pieces have stood the test of time and look forward to another lifetime. What kind of life did these heirlooms live before they came into our shop? Vintage items are special because they each have their own history. We love imagining the stories behind the unique pieces and unraveling as much of the history as we can through research. Did this Art Deco filigree ring belong to a 1920s flapper, fighting for women’s suffrage? Was this 1940s locket once given to a WWII soldier’s sweetheart before he left for war? We hope you find these one of a kind pieces as special as we do! ...but a business dedicated to making new memories while honoring the beauty and uniqueness of the past.